But instead I'm naughtily eyeing up goodies for myself. It's terrible, I can't help it! I'm doing well with my Christmas shopping so it's totally OK if I go ogle shinies for me right? Right? Help a gal out! Isn't this adorable?! I love the shoulder cut outs, and the dip dye look. Warm enough to make all snuggly for winter, but also light enough to wear in the spring time too when it starts warming up. I really, really love this. ASOS have this whole amazing range of holographic bags, purses and more. They are exactly the sort of colours you can wear with anything, and they will help dress an outfit up easily. The makeup bag is adorable and is so going on my Christmas list. There is a coin purse and a credit card holder, perfect to go inside this to keep your bag light. The office I work in has no in-built heating, it used to be a barn, so portable radiators and scarves are a must-have, and this looks so cosy and warm! 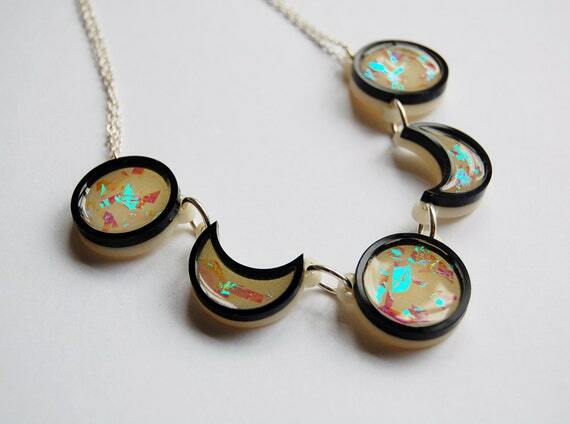 OK, so maybe I am liking the holographic trend kind of a lot, and this stunning necklace is really just feeding that! Katzeshop are a new discovery and they have the most beautiful jewellery. With recurring themes of moons, cats and shininess, how could I resist? What are you lusting after for this winter?